The forest here is full of biodiversity. You have the macaques, monitor lizards, birds of prey, ground squirrels and an abundance of different insects. My focus was on the lepidoptera (moths and butterflies). I was interested in identifying as many as possible, yet this was easier said than done, as most do not stay in one place even for a second and I only gave myself 3 days to complete the task. 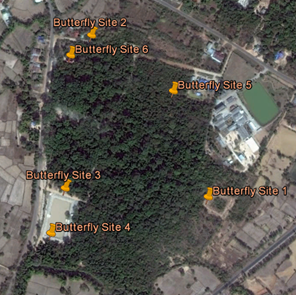 Butterflies can be seen throughout the forest and there is even much diversity in the species in the town itself. Look hard enough and you will find a new species every day. I decided to record what I observed in a few specific locations in the forest, where if you spent just 15 minutes in each site, you would be able to see a range of different species in each location. Butterflies unidentified: Black with swallow tail and white markings (possibly Common Mormon), large white/cream very common throughout forest, brown underside of wings with blue on inside (see picture). Other notes: Found 2 different kinds of caterpillar. One belonging to Tawny Coster (red spiky). 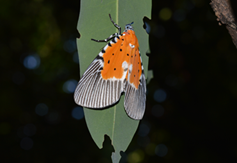 Tawny Coster (Acraea terpsicore). Host plant is the passion flower which are found in site 1. Below is its larval form. Photo by Helen Ford. 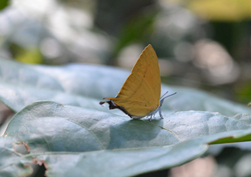 Grass Yellow Butterfly (Eurema hecabe). Photo by Helen Ford. As yet unidentified caterpillar. Photo by Helen Ford. 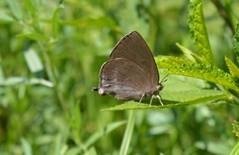 Unidentified butterfly. Photo by Helen Ford. 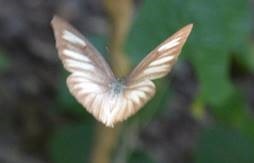 Unidentified: suspected lime butterfly, other white with black markings, black with white bottom and bluish black tinge. Other notes: On way to site, on path from shrine spotted Peridrome orbicularis, (see other locations) on underside of a leaf. (Spotted again on Buddha Path near Buddha 1 the following day at similar time). 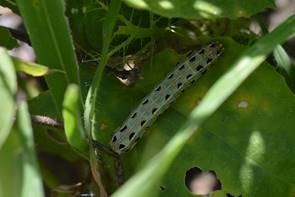 Unidentified: Lots of large white/ cream butterflies, small white with black markings, white and black spotted- possibly Common Mime. Peridrome orbicularis. Sighted between Site 1 and Shrine. Sighted on Buddha path between central road and Buddha 3. Google Earth, 29/01/2014. 15⁰40’09.51” N 104⁰51’31.65” E, elevation 152 m.